TREC has a fleet of four Geoprobes to meet your site investigation needs. All units are newer models with the latest in direct push technology. Our staff of operators have over 50 years of direct push experience. 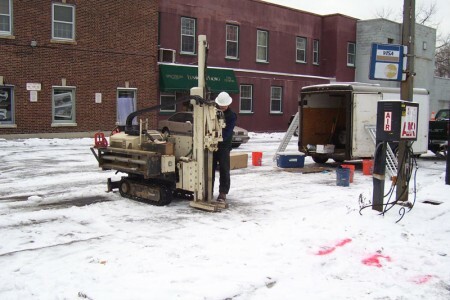 As part of our Geoprobe™ services, we also offer air knifing utility location. Using compressed air and our state of the art Utilivac we are able to locate and clear site utility prior to drilling or excavation work. The smallest track mounted rig allows site investigations to be performed inside of buildings that have a thirty-six inch wide doorway. The Model 54 LT specification sheet is linked here. 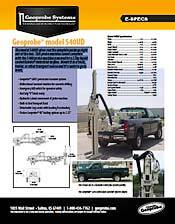 Geoprobe™ Model 6620 DT– This larger track mounted Geoprobe allows access in the roughest terrains. Its larger size allows us to drive larger probes and achieve greater depths. This rig also turns 4.25 inch hollow stem augers allowing for the installation of 2″ monitoring wells. The Model 6620 DT specification sheet is linked here. The E-540 has a 22 horsepower engine and is otherwise a traditional Geoprobe rig for sites that have good access. The specification sheet for the Model E-540UD is linked here. 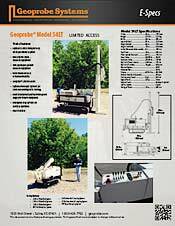 The Geoprobe™ Model 420 M is a limited access unit, which attaches to a remote power unit. 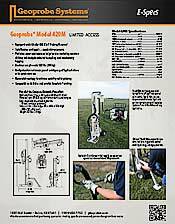 The specification sheet for the Model 420 M is linked here. 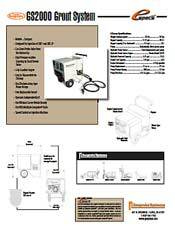 Geoprobe™ GS2000 grout pump – Used for ORC, HRC and other chemical reagent injections. 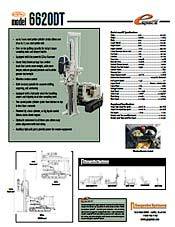 A specification sheet for the GS2000 Grout System is linked here.